Preheat the oven to 180°C. Slice 1 onion into half rings and quarter 20 mushrooms. Cut slices of the blue cheese (about 3 slices of cheese per burger). Bake the onion and mushrooms until golden. Put the 4 O Mundo Hamburger Buns in the oven for 5 min. Heat a frying pan with a little oil and sear one side of the 4 beef patties. Turn the patty around and sear the other side. Add the blue cheese slices immediately onto the burgers and let it melt. Take the O Mundo Buns out of the oven and cut them open. Add mayonnaise and ketchup, the watercress and arugula. Add the beef patty and top it with the onion and mushrooms. Heat a baking pan and bake 8 bacon strips until crispy. Slice 1 onion in half rings and bake them in the same pan as used for the bacon strips. Put 4 O Mundo Burger Buns in a preheated oven (180°C) for 5 min. Slice 2 tomatoes in 8 slices and take some lettuce leafs. Reheat the frying pan with 1 tbsp. of olive oil. Sear the 4 beef patties on one side. Flip the beef patty and sear the other side as well. Lay a slice of Gouda Cheese on every burger and make sure it melts. Take the O Mundo Burger Buns out of the oven and cut them open. Add to every bun; lettuce, tomato and the bacon. 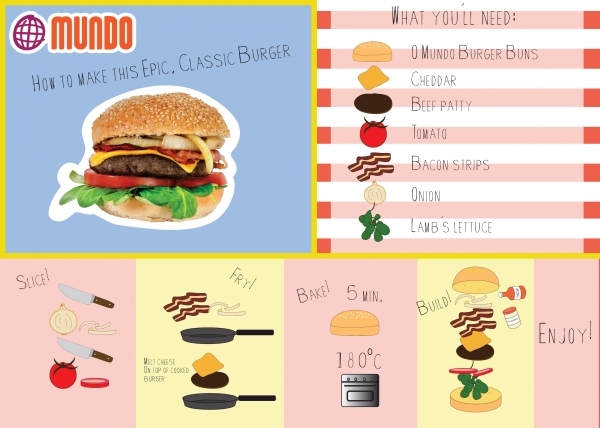 Add the beef patty with melted cheese on the O Mundo Burger Buns. Top with the onion and add some mayonnaise and ketchup. 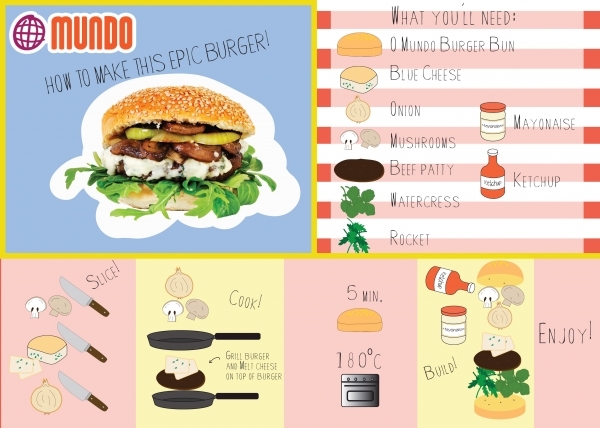 Preheat the oven on 180°C and place the 4 O Mundo Burger Buns in the oven for 5 min. Meanwhile clean 400 gr. of salmon filet and cut it in pieces. Cut 2 spring onions, ½ red chilli pepper (no seeds), 2 cloves of garlic into pieces. Take a handful of coriander leaves and mix everything with a 1 tbsp. of sesame oil and the juice of one lime in a blender. It doesn’t have to be a smooth mass. The texture can be rough. Use the mixture to make 4 patties. Heat a frying pan with a little olive oil and cook the salmon burgers for 10 min. Mix 2 tbsp. of mayonnaise and 2 tbsp. of wasabi. Cut the O Mundo burger buns open and add some lamb’s lettuce. 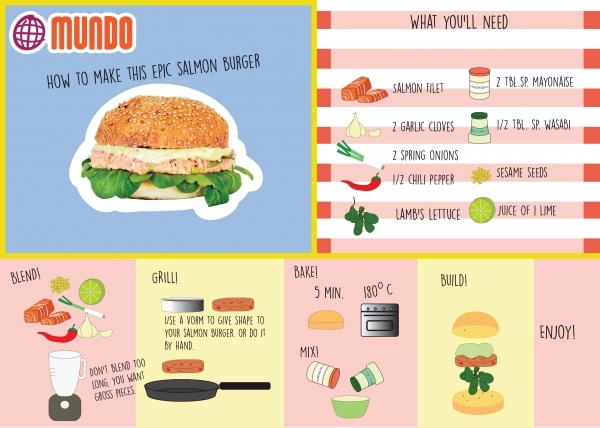 Lay the salmon burgers into the O Mundo Burger Buns and top with the wasabi-mayonnaise.